When you live near the water like many people in Pompano Beach, and the rest of Broward County do, it’s important to remember a potential danger that comes with waterfront living: flooding. If your home has ever been exposed to a flood, then you know that it’s a scary, and stress inducing situation. The well-being of property, pets, and loved ones will be at the forefront of your mind. It’s important to know what to do if your home and your family is ever exposed to this awful situation. Living near the water heightens your chances of experiencing a flood. But, rising water is not the only way your home can become flooded. It’s possible that something in your home can be the source of the flooding. Things as simple as a clogged sink or a burst pipe can inundate large areas of your home. Enter the story of an actual client that Restoration USA experienced in January of 2017. The owner of the home was defrosting chicken in her sink by running water over it. The home owner didn’t realize the chicken was actually blocking the drain in her sink. So, the owner of the home went about her evening and fell asleep for about an hour with the water running. She was awoken to banging on her door from neighbors beneath her in her apartment building. The neighbors said that they were having water dripping from their ceiling. The water that was running in the sink for an hour began to overflow, and entirely flood her kitchen. At the same time, the water seeped through her floor, and through the ceilings of her downstairs neighbors. 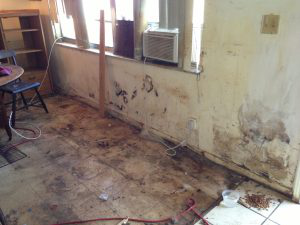 Luckily, that homeowner was quick on her feet, and on her phone, to call Restoration USA. Restoration USA was there after-hours to begin the flood clean up service. The homeowner had homeowner’s insurance. Fortunate for her, she didn’t pay a cent for the clean up services, and it was covered entirely by her insurance provider. Also, thanks to her acting quickly, the issue required no more than flood clean-up, and dry out services. After experiencing a flood, the best route of action is to call a professional. This rule of thumb can be applied to any disaster your home encounters. Whether its water damage, mold, or even a fire, you should call a professional. While it’s important to call a professional, it’s also important to know whether that person or company is really a professional. There’s many fly-by-night companies that will try to pull wool over the eyes of unsuspecting home owners. You must make sure that any company you allow into your home is licensed, insured, and capable of handling the job you assign them. In the case of the homeowner we discussed earlier, she was lucky, and landed in the hands of Restoration USA. To learn more about what goes into a good home restoration company, check out this earlier post from our blog. Any Restoration company’s main goal should be to assist the homeowner in their time of need. Another goal for the company is to help the homeowner pay as little as possible. Finding an honest, reputable restoration company can be a challenge. But, through doing research, you can find a licensed company that will take good care of you and your home. Restoration USA is a fully certified disaster restoration company located in Pompano Beach. Restoration USA restores water damage and fire damage. We also perform mold removal and leak detection, in all of Broward county. Most of the services we perform can be paid for by standard home owner’s insurance. Call us, toll-free, 24/7 at (866) 745-6428 or visit us online to schedule your free evaluation. Restoration USA Tips: How Do House Fires Most Commonly Start?